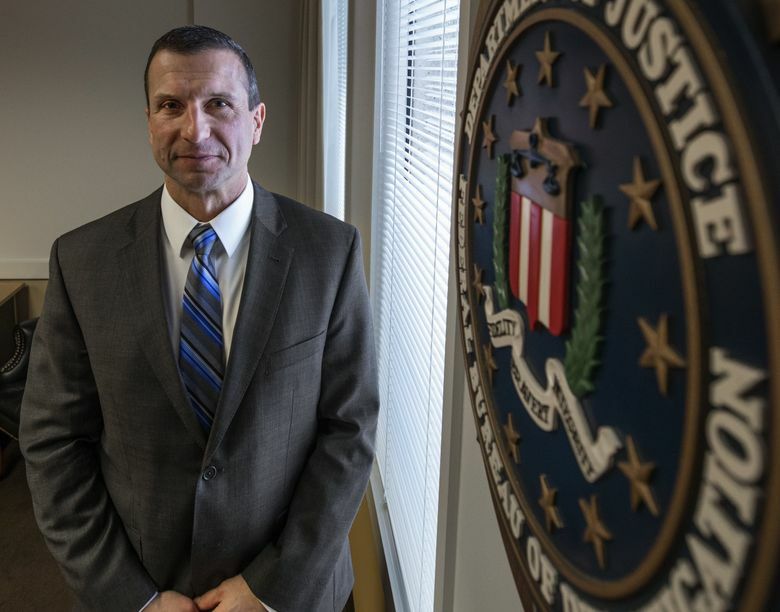 New FBI special agent in charge Raymond Duda said one of his goals is to eliminate misperceptions about the agency, such as that it focuses its terrorism investigations on foreigners. The reality is that the "vast majority" of those probes involve "white U.S. citizens," he said. Seattle’s new FBI Special Agent in Charge, Raymond Duda, was asked Thursday during a meet-and-greet with local media about President Trump’s repeated attacks on the agency’s credibility. Duda spent an hour in a generalized rundown of the agency’s priorities, commented on the impact of the most recent government shutdown, and the sticker-shock of moving to Seattle after assignments in Charlotte, West Virginia, Pittsburgh and Maryland, where he served most recently as the FBI’s cyber crime section chief and the bureau’s liaison to U.S. Cyber Command and the National Security Agency. “I maybe wasn’t prepared for the cost of living,” Duda, who has worked for 27 years at the FBI, said a little ruefully. “I wish my apartment was as big as this conference room,” he added, referring to a large wood-paneled room adjoining his upper-floor office in the Abraham Lincoln Building at Third Avenue and Spring Street. He declined to talk about any specific investigation except the bureau’s nearly 18-year effort to solve the shooting death of Assistant U.S. Attorney Thomas Wales, whose killing has been the focus of a task force since he was gunned down in the basement of his Queen Anne home in October 2001. The FBI has offered a reward of up to $1 million for information leading to the arrest and conviction of the person responsible. “It is a priority for this office,” said Duda, who has experience as a homicide investigator after the bureau joined with local law enforcement to establish a cold-case homicide initiative in Charlotte. The Wales investigation remains active, he said. The FBI believes there are “individuals out there” who have information that could solve it. In the past, the task force has focused on an airline pilot prosecuted by Wales in a Seattle white-collar case in the late 1990s in which charges against him were eventually dismissed. The pilot sued the government for wrongful prosecution but lost. The office’s other priorities include fighting terrorism, counterintelligence, exploitation of children and violent crime. Duda’s personal goal includes improving the bureau’s relationships with local law enforcement. The bureau relies on manpower from local agencies to help staff a myriad joint local-state-federal task forces fighting everything from terrorism to child exploitation to gang violence. On terrorism, the Seattle FBI has been involved in several major international terrorism investigations, including the arrest and prosecution of Ahmed Ressam, an Algerian national who was stopped at the northern border in December 1999 with the makings of a powerful explosive in the trunk of his car. An investigation later revealed that he harbored hatred of the U.S., which was nurtured in Osama bin Laden’s Afghan training camps during the Taliban’s reign. Ressam became one of the United States’ primary sources of al-Qaida insider information after the 9/11 terrorist attacks. He is serving a 37-year prison term for a plot that involved the planned detonation of a massive suitcase bomb at the Los Angeles International Airport during the millennium celebrations. Duda said one of his goals is to eliminate misperceptions about the agency, and one of those is that it focuses its terrorism investigations on foreigners. The reality is that the “vast majority” of those probes involve “white U.S. citizens,” he said.